The history of the Dominican Republic can be very fascinating but here are just some key points in this country’s history. “The island of Hispaniola, of which the Dominican Republic forms the eastern two-thirds and Haiti the remainder, was originally occupied by Tainos, an Arawak-speaking people. 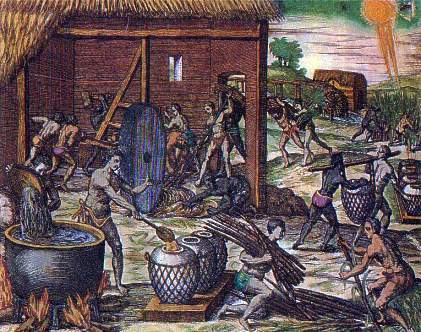 The Tainos welcomed Columbus in his first voyage in 1492, but subsequent colonizers were brutal, reducing the Taino population from about 1 million to about 500 in 50 years. To ensure adequate labor for plantations, the Spanish brought African slaves to the island beginning in 1503,” (https://www.state.gov/r/pa/ei/bgn/35639.htm). “In the next century, French settlers occupied the western end of the island, which Spain ceded to France in 1697, and which, in 1804, became the Republic of Haiti. The Haitians conquered the whole island in 1822 and held it until 1844, when forces led by Juan Pablo Duarte, the hero of Dominican independence, drove them out and established the Dominican Republic as an independent state. In 1861, the Dominicans voluntarily returned to the Spanish Empire; in 1865, independence was restored. Economic difficulties, the threat of European intervention, and ongoing internal disorders led to a U.S. occupation in 1916 and the establishment of a military government in the Dominican Republic. The occupation ended in 1924, with a democratically elected Dominican Government,” (https://www.state.gov/r/pa/ei/bgn/35639.htm).